Den första & enda Fantasy Premier League-ligan med egen podd. En sportpodd med fokus på #FPL och mycket prat om avgångar. One of the best, if not the best commercials ever made. This is very sad news for Tre Kronor (Team Sweden) as well as hockey world wide. Today at a press conference in Sweden (Swedish), Mats Sundin announced his retirement from professional hockey at the age of 38. I would have loved to play until the age of 65, but as a hockey player you obviously retire a little earlier than that. To me, Mats Sundin is the greatest hockey player to ever come out of Sweden, and possibly the greatest leader sport has ever seen. One can of course always discuss what impact the likes of Lidström, Forsberg, and earlier players such as Salming had on the game – but to me, Sundin is simply in a class of his own. Before every major national competition (Olympcs, World Cup, so on and so forth), there’s always a discussion regarding what stars that will play for their country; for Sundin however, the answer was always as clear as the Caribbean waters – he always played and he always led. Toronto is and will always be my second home. Of course, with Sundin having close to God-like status over in hockey-land Canada, this story has already been picked up by local news over in Toronto. They’ve even been kind enough to do a recap video of Sundin’s legacy with the Leafs. Sundin ends his career as the longest-serving European captain in NHL history and the top scoring Swedish and Toronto Maple Leafs player in NHL history (564 goals, 785 assists and 1,349 points). A truly remarkable record. I posted a piece on Sundin’s return to Toronto earlier this year. He came there as the enemy with his new club Vancover Canucks and was booed for about 10 minutes of the first period. Not the reception that myself, experts, or fellow players would have expected. Once the crowd had settled down though, he eventually got what he deserved. It still gives me goose bumps. Read the full story in the continuously updated NHL.com article (other sources: TSN, CBC, Twitter). Wow, this is great news from the team behind one of my favorite websites, FootyTube. In a recent article by Steve Wilson of The Telegraph (UK), FootyTube was named one of the top 25 football sites on the web, despite still being in beta. My many congratulations for all of the hard work! It’s finally starting to pay off. There are of course a couple of other good spots on the list. Two of my other “must read on a daily basis” tips would be Soccernet, closely followed by BBC Football. You can also read what Lee of FootyTube thoughts are on the list, and what he feel was missed. A site I didn’t know about, which I found through Lee’s post is Footballfilter, it’s sort of a popurls-clone, a mashup but with football sources only. Being a frequent flyer of the iPhone, I have to give Footballfilter credit for the Instapaper integration (hover over an article and check the right-hand side) as well as the use of RPX (OpenID and data portability). This is the way to go and I love it! FootballFilter is a compilation of the best Football* content available on the internet, including news, blogs, forums, pictures, videos and podcasts. All content is updated automatically so you can quickly scan all the latest stories that are appearing on the web. You can read a summary of each news item by hovering your mouse over the text. To read the full article just click on the link. Oh and, here you go Lee. Let me know if you need an even ‘better’ one! Closed systems are at the mercy of their creator having guessed at the optimal solution. Before I knew about the top 25 mentioning, this post was going to be on openfooty, FootyTube’s own API (featured below) which is currently in a closed beta. As of now, openfooty promises to be the most advanced completely free football API available. 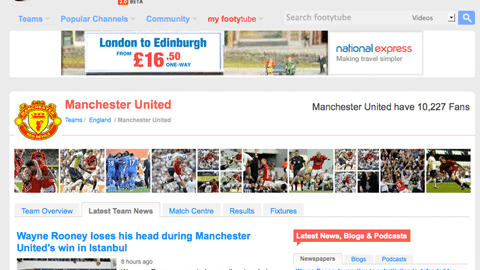 It offers access to much of the data that powers FootyTube on a daily basis; including fixtures, league tables, team standings, player data, team news, and of course, video. From the sound of it, it sounds as if FootyTube will prevail in this space through opening up their data to developers – something I’m of course in favor of. I hope it won’t be too long until FootyTube shows us what other fans, users, and developers have created with openfooty. Really looking forward to it! Klabbe har cancer, ge ett bidrag! Idag kom det fram att Klas Ingesson har cancer — aldrig har det varit så självklart att skänka pengar till cancerfonden om du aldrig tidigare engagerat dig. Klas Ingesson är en gammal barndomsfavorit, och jag lider med honom, vänner och familj. Ett ‘Kämpa Klabbe!’ är verkligen på sin plats. Klas Ingessons kommentar var lika enkel som självklar: “Nu väntar hårt arbete och jäklar anamma”. Jag lyckades även hitta den här störtsköna bilden på Klabbe tillsammans med Guld-Gary och Pär Zetterberg (frisyren är priceless). https://oscarkarlsten.com/wp-content/uploads/2009/05/22s99klas.jpg 900 1200 Oscar Karlsten https://oscarkarlsten.com/wp-content/uploads/2013/04/Oscar-Karlsten-logo2-300x137.png Oscar Karlsten2009-05-15 08:35:052014-03-24 20:54:59Klabbe har cancer, ge ett bidrag!